As Illinois Tech is a cashless university, the only forms of payment that the ACaPS office accepts are credit card, debit card, and electronic check. HOW DO I GET A HAWKCARD? 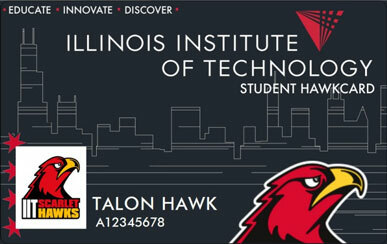 The first HawkCard ID is complimentary for Illinois Tech students, faculty, and staff. Tenants receive their first HawkCard without direct cost. HawkCard recipients must be registered with the university. Photo identification must be presented to have an ID produced. The cost to replace a lost, damaged, or stolen card is $20.00. All sales are final on replacement HawkCards and refunds will not be given. What if my hawkcard is lost or stolen? A replacement HawkCard can be purchased at the ACaPS office, Hermann Hall, Room 201. The cost to replace a lost, damaged, or stolen card is $20.00. All sales are final on replacement HawkCards and refunds will not be given. HOW DO I GET DOOR ACCESS ON MY HAWKCARD? Access to exterior campus doors is assigned automatically, on the basis of customer affiliation. All other requests should be initiated by the responsible party of the access area by submitting an email to hawkcard@iit.edu. HOW DO I ADD TECHCASH TO MY HAWKCARD? Illinois Tech students, faculty, and staff can access their TechCash account via the GET!-MyHawkCard website and add funds in real time by credit or debit card. A $1 convenience fee will be applied. Friends and family may add funds as a guest using their ID number without accessing the account. Deposits can be made without the convenience fee through the ACaPS Online Store utilizing electronic check. Funds for these deposits will not be available until the next business day. HOW DOES VISITOR PARKING WORK? Visitor parking is first-come, first-served in designated pay lots. Visitor pay stations accept credit/debit cards or paid parking codes only. A valid permit is required as the lots are actively enforced by permit. WHAT ACCESSIBLE PARKING OPTIONS ARE AVAILABLE? Visitors displaying a state handicap placard may park in designated spaces on a complimentary basis. Illinois Tech students, faculty, and staff are expected to obtain a registered parking permit. Visit the Accessible Parking page for details. Students, faculty, staff, tenants, and affiliates are eligible for registered parking permits on an annual, academic, or semester basis. Only one sticker is issued per customer, but alternate vehicles may be linked to the permit. Parking registration is available online. Standard enforcement hours are Monday-Friday, 7am-7pm. Reserved spaces, restricted areas, and no parking zones are enforced 24/7. Citations must be paid or appealed within 7 days of the citation issue date. Appeals are reviewed by an anonymous university committee independent of the ACaPS Office. Decisions will be communicated within 14 days. Once a citation is appealed, no action is required until the decision is communicated. Appeal committee decisions will be considered final. HOW DO I GET A VENDING REFUND? Vending refund requests are processed in the ACaPS Office, Hermann Hall, Room 201.